The annual use amount of P3 is 1005 litres concentrate. According to the WIDES database P3 is certified for surface wipe disinfection. The relevant spectrum of activity is: bactericidal (not Mycobacteria) + yeasticidal with clean conditions plus mechanical action. To reach the certified efficacy a 0.5 % dilution of P3 has to be distributed on the floor and left to act at least for one hour. H-phrase according to safety data sheet: In this column the hazard statements given by the manufacturer in his product safety data sheet are cited. H-phrase according to WIDES: In this column a consolidated version of the hazard statements used for the WIDES assessment is given. Since the latter is compared with the classification given in REACH Dossiers or Risk Assessment Reports it is more reliable and relevant. Therefore this classification is taken over into the list. For P3 the used amount of product is 1005 litres concentrate. In Table 1 hazard statements identified as unwanted are indicated in column 4. Columns 5, 6 and 7 indicated the calculated loads. Finally a conversion is made from litre into kilogram. 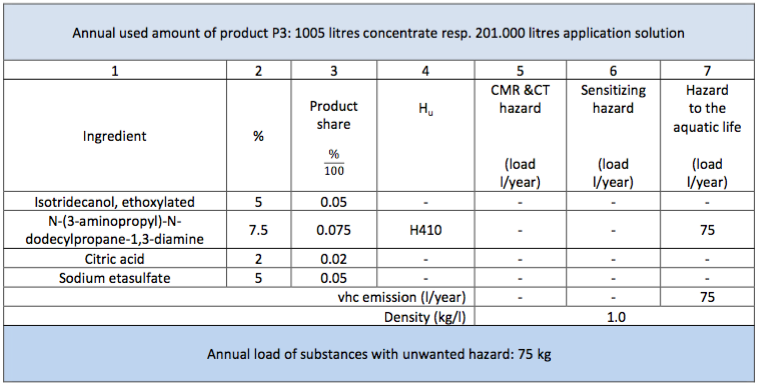 The density of P3 according to the Safety Data Sheet is 1.03 which in the example is roughly estimated with 1 kg/l. If however the density deviates significantly from 1 (e.g. for alcohols) the real density has to be considered. The result can be summarized as follows: The use of product P3 generates an annual load of 75 kg substances with unwanted hazard. The calculated load affects to 100% the aquatic life. After Log-In and opening the modul Products the application Surface Wipe Disinfection was activated. In the drop-down list the exposure time 1h and the spectrum of activity bactericidal (not Mycobacteria) + yeasticidal, clean cond. + mechanic action was selected and afterwards the button Go to assessment was pressed. 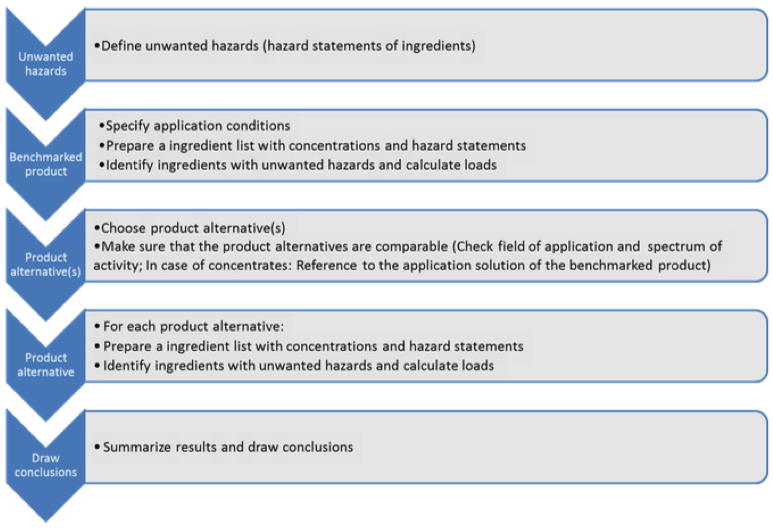 The query resulted in a list of product alternatives for P3 (product name, manufacturer, active ingredients) together with their WIDES assessment in six hazard categories. In the case at hand the WIDES query delivered 31 product entries. From these in a next step three products were selected as “Best Case” (comparatively low hazard potential) and three products as “Worst Case” (comparatively high hazard potential). The selection was made by means of the WIDES product assessment. The assessment is presented visually in terms of colour fields from pale yellow (low hazard), orange (medium hazard) to deep orange or red (high or very high hazard). Question marks in the colour fields indicate data gaps in the underlying dataset. External users are dependent on a visual analysis respectively interpretation of the spectrum of colours. 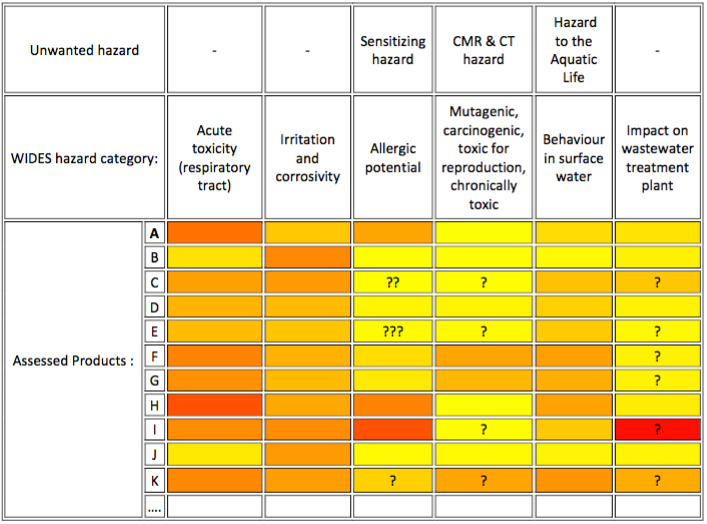 Benchmarks with a comparatively low hazard potential (Best Case) would be products B and J (Colour fields in the hazard categories Allergenic potential; Mutagenic, carcinogenic, toxic for reproduction, chronically toxic and Behaviour in surface waters are pale yellow). The system administrators of the WIDES can additionally reference to the product assessment numbers which are invisible for the external users. By using the WIDES database for choosing product alternatives it is automatically ensured that P3 and their alternatives are comparable in the field of application and the spectrum of activity. The product P3 is – since it is listed in the WIDES – part of the product list. If the WIDES is not used for the choice of product alternatives, the comparability has to be ensured by means of the specifications of the manufacturer and certificates. In case that concentrates are compared, the following has to be considered: Since both the benchmarked product P3 and the product alternatives have to be diluted prior to application the calculation of the load has to be referenced to the amount of application solution of the benchmarked product. Since for P3 the concentration for application is 0.5% and the annual consumption is 1005 litres concentrate this results into an annual application solution of 201.000 litres. Therefore the product alternatives also have to generate 201.000 litres of application solution. This can lead to different amounts of concentrates: If a product alternative is used as a 1% application solution, then 2010 litres of concentrate is needed to generate 201.000 litres of application solution. In the case study at hand 6 product alternatives were selected namely 3 as Best Case benchmarks and three representing Worst Case benchmarks. For each product alternative an ingredient list has been established and loads were calculated. Since the benchmarking in its essence is a comparison the summary and presentation of the results are a crucial point of the method. For that options for presentation in terms of tables, graphs and text are presented below. They are an excerpt of the consultation project. Therein the product P3 is compared with the three “Best Case” and the 3 “Worst Case” alternatives. The use of product P3 generates a load of 75 kg substances with unwanted hazards. The load affects the aquatic environment up to 100 %. There are products available on the market for the same application and with the same efficacy which emit 0 kg of substances with unwanted hazard. With the limitation that material incompatibilities and working conditions are not explicitly taken into account a substitution of P3 should be taken into consideration (potential for improvement).